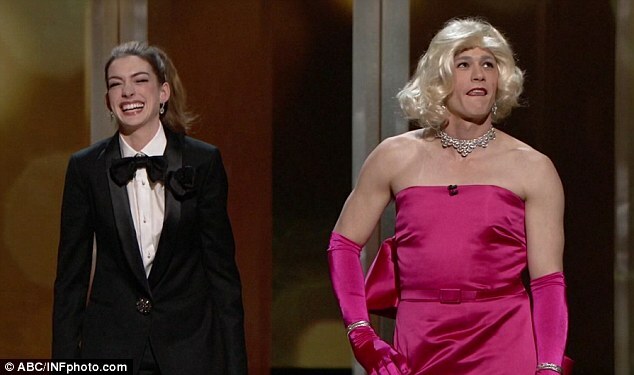 Hosting the Oscars may well have been Anne Hathaway's most important role to date. And with the top honour came some serious couture. The 28-year-old changed into an incredible eight difference outfits throughout the night. She started out the evening in a Valentino, and even had the designer himself on hand in case of a red carpet emergency. 'I have a needle and thread in my pocket just in case, ' the designer told the Daily Mail. She was styled by celebrity favourite Rachel Zoe and was adorned in Tiffany jewels throughout the ceremony. Opening the awards, Hathaway slipped into a cream-coloured strapless Givenchy Haute Couture by Riccardo Tisci gown. Accessorising the look with a diamond ring, bracelet and earrings, she was positively glittering. 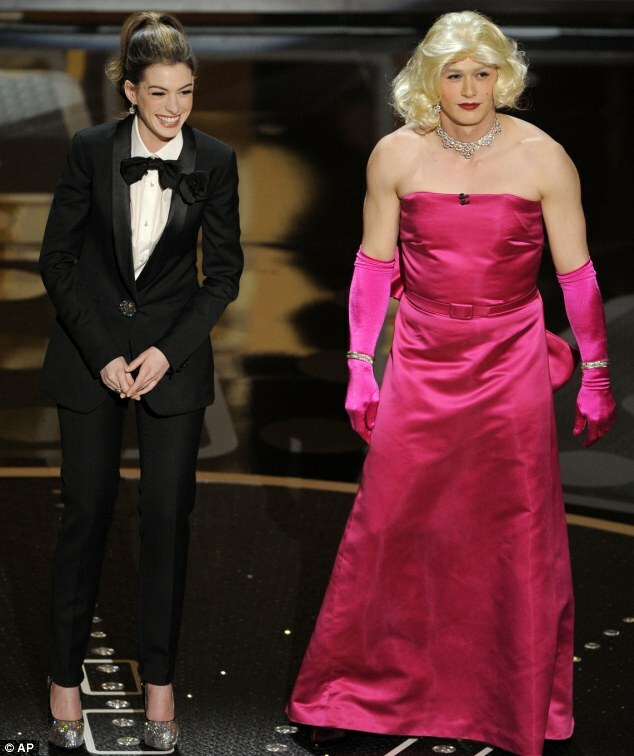 Her next look was especially styled for her hilarious cross-dressing spoof with co-host James Franco. Emerging in a custom tuxedo by Lanvin she managed to make the androgynous theme still look somewhat feminine. For her third look, the Hathaway slipped into a Vivienne Westwood corseted gown layered with taffeta and lace smattered with sequins. The princess-style gown was said to have been specially designed for the actress in London. Setting off the grey tones, she paired the gown with a stunning diamond and dusty amethyst necklace from the Tiffany Archives. 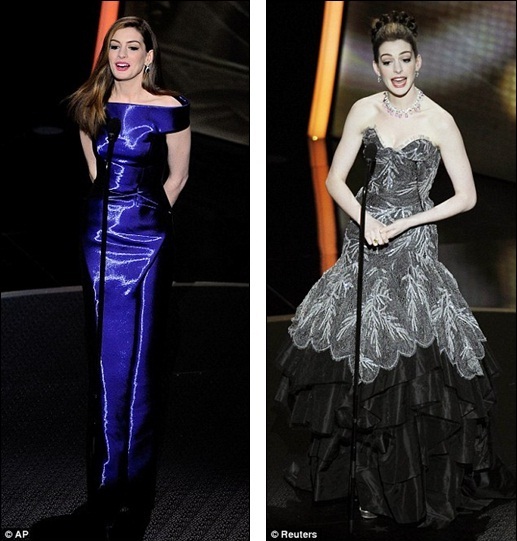 The biggest risk for Hathaway came in her silver-tasselled Oscar de la Renta gown. But she turned the disco themed ensemble from bordering on tacky to sophisticated, by once again dripping in Tiffany jewels and also slipping her feet into some Jimmy Choo heels. Next up was a burgundy silk gown by Atelier Versace. Perhaps the most stunning of the night, her figure looked incredible in the body-hugging Art Deco inspired bodice. It was followed by a sapphire Giorgio Armani Privé satin column dress which gave a memorising effect on screen with it's shiny accents. Accentuating the blue tone, she slipped on a pair of Tanzanite and diamond earrings, a black onyx and diamond bracelet, and a diamond and sapphire ring. Finishing off her hosting duties, Hathaway finally slipped into a slinky Tom Ford smoky grey lace and crystal adorned gown. Hathaway is the youngest person to host the show, which was broadcast live in more than 200 countries worldwide. The pair were also spotted together at the star-studded Vanity Fair after party. Scarlett Johansson took her agent Joe Machota along as her date to the Oscars. The 26-year-old star split from husband Ryan Reynolds last year and was spotted with a mystery man on the red carpet of the Kodak Theatre as she made her way to the 83rd Academy Awards. 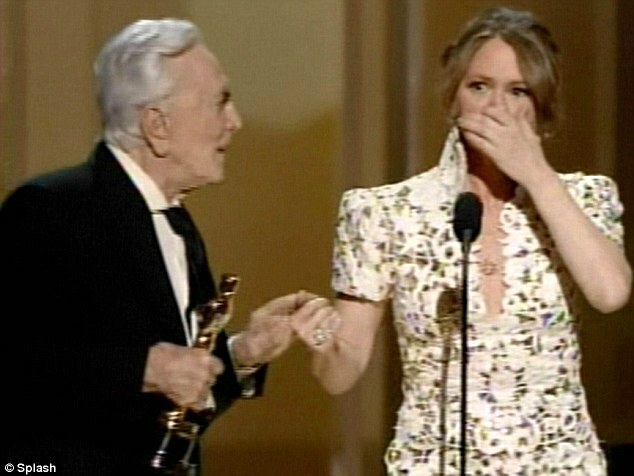 Her spokesperson has now confirmed that her date was in fact her agent, who also represents actress Jane Fonda. The representative told Us Magazine the relationship is platonic. The Iron Man 2 star was most recently linked to Oscar-winning actor Sean Penn, 50, earlier this year. She has also been seen enjoying the company of Saturday Night Live comedian Jason Sudukis and He's Just Not That Into You co-star Justin Long. She has also previously taken her twin brother, Hunter Johansson, to awards shows. Scarlett and Ryan filed for divorce back in December after just two years of marriage. He was quickly linked to his Proposal co-star Sandra Bullock after the pair spent New Year's Eve together. However, the actress denied any romance, insisting the pair are just friends. The Lost In Translaterion star, who was dressed in a bold Dolce & Gabbana confection, presented a best sound award with Matthew McConnaughey during the ceremony. Christian Dior needs all the good press it can get following John Galliano's arrest last week - but the fashion house failed to win the plaudits it was hoping for when it dressed Nicole Kidman for the Oscars last night. The white Oriental-inspired gown seemed to wear the actress rather than the other way around - the colour was far too bridal and the embellishment dated and ageing. And while the 43-year-old's make-up was fresh and pretty - she appears to have eased up on the Botox a little too - her hair was all wrong. The girlish ponytail was far too casual for such a formal dress and occasion and a chic up-do would have been far better. 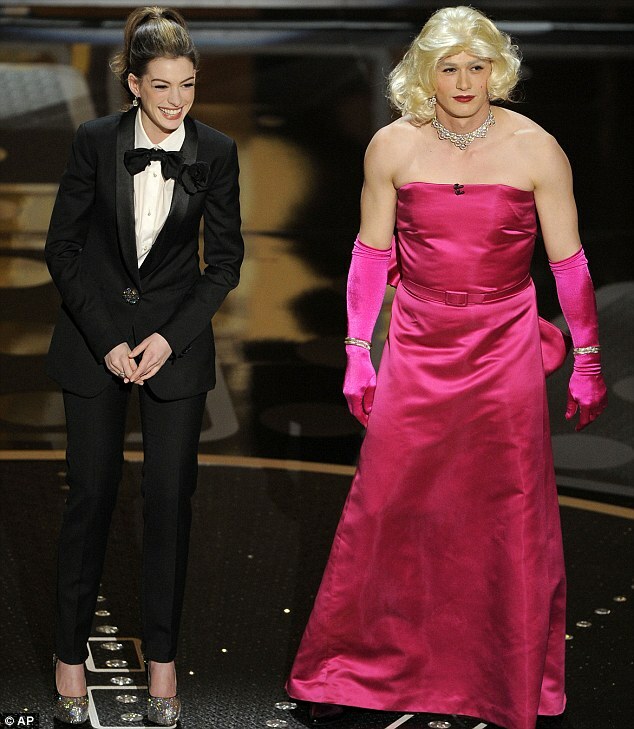 Cate Blanchett was another that the fashion police had their claws out for. Though she went for a high-fashion choice in Givenchy Haute Couture, the lavender and yellow colour scheme was unorthodox, and, while the statuesque star somehow pulled off the bib-like top, it would have looked comical on anyone else. Another surprising fashion fail was Michelle Williams in Chanel. While we hate to critique anything Karl Lagerfeld designs, the Blue Valentine star's 'greige' gown was not a flattering choice. The capped T-shirt-style sleeves looked too casual and scruffy for such a glamorous event, and the bizarre seams at the bust looked as though the fabric had ripped. Williams redeemed herself with flawless make-up though, and her gamine blonde crop looked fresh and modern. Melissa Leo's Marc Bouwer dress also failed to impress - she too went for T-shirt-length sleeves on a dress embellished with what appeared to be silver foil, giving it something of a wrapping paper effect. 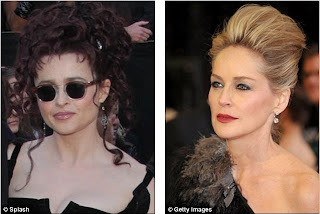 It is hard to criticise Helena Bonham Carter as she is so wonderfully eccentric, and her black dress by Alice in Wonderland costume designer Colleen Atwood was a vast improvement on recent red carpet attempts. But for some unknown reason she hit the red carpet in bizarre round sunglasses - were the camera flashes too bright for her? She showed support for her fellow British stars by wearing a Union Jack around her calf by way of a garter - something she proudly flashed to the crowd as she walked the red carpet. While Bonham-Carter clearly doesn't take herself too seriously, there were some who clearly do: namely Sharon Stone, who looked rather terrifying as she smouldered for the cameras. The actress, 52, wore a black gown with an asymmetric neckline decorated with black and grey ostrich feathers. The knot of fabric above the knee looked awkward and uncomfortable though, and her make-up was far too heavy. A softer look, like that created by Nicole Kidman's artist, would have been much more elegant. Others who fell short of the mark were Michelle Williams's friend and plus-one, Busy Philipps. The dress, with its mixed textures and bows looked like a sweet wrapper, and made the slim actress look larger than she really is. Virginia Madsen should have taken a leaf from Reese Witherspoon's book when she opted for monochrome - the ruffled dress was too tissue paper-like, making it look cheap. And Mark Ruffalo's wife Sunrise Coigney went too far the other way with a far too fashion-forward look by Jean Paul Gaultier. The statement shoulderpiece on her dress was distracting, and the overall look was too aggressive with her severe haircut. Nicole Kidman's dress was designed by British fashion designer John Galliano, who allegedly assaulted a respected art historian last week in an unprovoked attack in Paris. The designer, 50, is said to have launched an anti-Semitic tirade against curator Geraldine Bloch, 35. Mr Galliano was arrested and has since been suspended from his job as chief designer at Christian Dior, putting his upcoming autumn/winter ready-to-wear collection for the fashion house in jeopardy. A Paris police spokesman confirmed all details of the allegations against Mr Galliano, and said he was facing criminal charges. 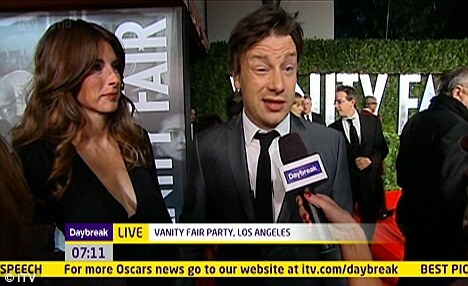 Kate Garraway came close to a very awkward moment while chatting to the stars at the Vanity Fair post-Oscars bash last night, when she told Daybreak viewers that she couldn't understand how Jamie Oliver managed to get an invite... and moments later he walked past. Despite appearing to snub him mere seconds earlier, the entertainment reporter excitedly waved him over for a gushing interview. The 43-year-old did an about face, though, when the TV chef and his wife Jools ambled by on their way into the bash. Jamie, 35, unaware of his celebrity status being called into question, happily obliged, telling Kate how he had just met Best Actor winner Colin Firth the week before. Kate also chatted to ex-pat Kate Beckinsale and Tom Hanks, who both gushed about the success of The King's Speech. Underworld actress Kate told the presenter that she had attended university with the film's director Tom Hooper, and he had asked her to be in a play in their first year. 'So it was surreal, exciting and brilliant to see him win,' she said. Tom Hanks left Garraway speechless with his enthusiastic crowing about the film's success. 'Congratulations Britain! You've done it! The King's Speech has taken America by storm. We're exhausted from The King's Speech,' he said. 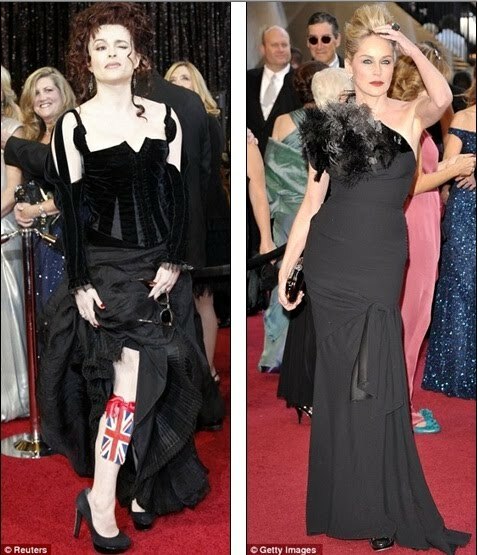 Helena Bonham Carter, who missed out on a gong for Best Supporting Actress, showed Kate her would-be acceptance speech, which was printed on a giant handkerchief. 'It will never be seen,' she said. With temperatures dropping to as low as minus 1C in Vancouver, Canada, locals are wrapping up warm to protect themselves from the bitter cold. But little Suri Cruise is clearly determined to put style above comfort, stepping out in a flimsy dress and bare legs as she went for cupcakes with her mother Katie Holmes in the city yesterday. The four-year-old did give in to the wintery conditions at all, wearing pink boots and a bright pink jacket, but didn't appear to be staying warm in her thin dress. Meanwhile, Katie, 32, opted for black trousers, a long coat, knee-high boots and a scarf for the trip out. And they have certainly been making the most of their time in Vancouver, popping out on regular coffee runs, with Suri even permitted to follow in her mother's footsteps by getting coffee of her own. It seems Suri's favourite colour of the moment is pink, as she appears to be continually choosing clothes in the sweet shade for her days out. Tom and Katie have both previously spoken about Suri's passion for fashion, with Katie admitting her daughter is developing a love of shopping. Katie added she finds it amazing that Suri also gives her fashion advice on what or what not to wear on the red carpet. She laughed: 'She’ll really tell me what she thinks. Like today I’m wearing brown suede pants, and she said, "I don’t like your pants." It had been hoped that employing Anne Hathaway and James Franco as hosts for this year's Oscars would give the ceremony a young and fresh feel. 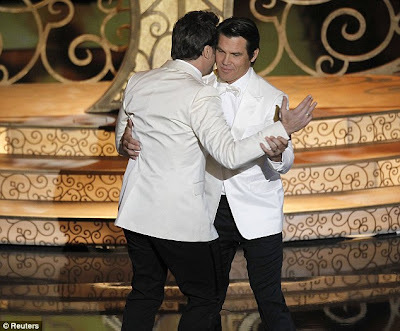 But despite bringing their considerable comedic talents to the plate while presenting the Academy Awards, using skits and montages to add to their hosting duties, the pair's performance was met with mixed critical reception. 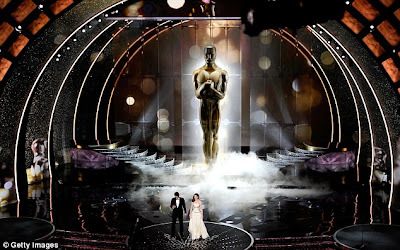 The 83rd Academy Awards opened with a montage of Hathaway and Franco delving into the mind of former Oscar winner Alec Baldwin in an Inception-inspired moment, narrated by the smooth-voiced Morgan Freeman. And things continued to get more and more surreal, as the pair poked fun at The King's Speech, which took home four Oscars, The Fighter and True Grit, as well as The Social Network and Back to the Future. Perhaps the funniest moment of the opening montage, however, was Hathaway and Franco both donning leotards and tutus to join Natalie Portman in Black Swan. The pair attempted to impress the hard-nosed Vincent Cassel with their dancing abilities, and left Portman looking flustered with their 'talent'. 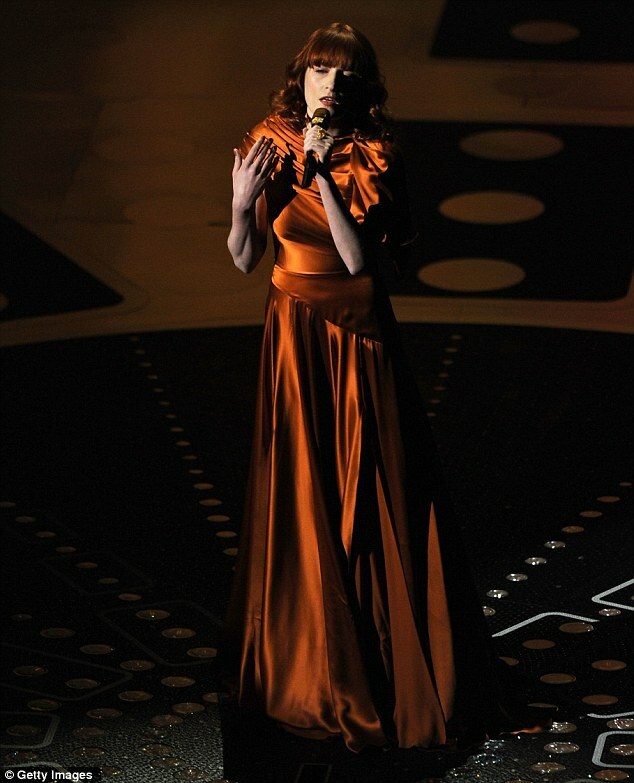 Hathaway also returned to her former duty at the Oscars in 2009 when she joined then-host Hugh Jackman for a duet to open the show. 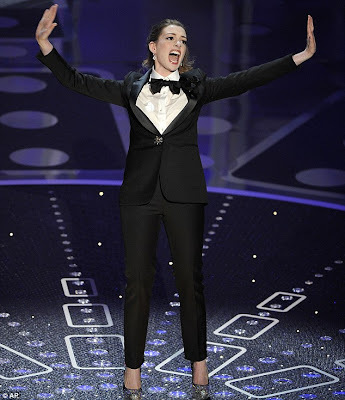 Paying tribute to the track, Hathaway donned a tuxedo to perform a comic rendition of On My Own from Les Miserables. But Franco, determined not to be outdone, later donned a pink dress and blonde wig to come on to the stage as Marilyn Monroe and tell a joke about Charlie Sheen. However, if he had been hoping the joke earn him a reputation as a controversial host, it paled in comparison to Ricky Gervais' choice numbers at the Golden Globes earlier this year. Other montages throughout the show included a look back to Gone With The Wind and Lord of the Rings. And one of the most memorable montages of the evening was a clever piece using auto-tune technology to make songs out of dialogue from films including Twilight, which saw Edward and Bella sing 'He Doesn't Own a Shirt' about Jacob, Toy Story 3 and Harry Potter and the Deathly Hallows. One of the advantages of having a younger host, however, is that Franco used is considerable knowledge of social networking site Twitter to tweet fans throughout the show as the ceremony went out live on US television. Using the hash tag #OscarsRealTime, Franco tweeted photographs and video of himself, as well as a group shot with Hathaway and Oprah Winfrey, before later adding another one of the presenting pair and former host Billy Crystal. He later posted photographs of himself still wearing his tuxedo and enjoying a cocktail with 'Goodbye LA' scrawled over it in blue writing. 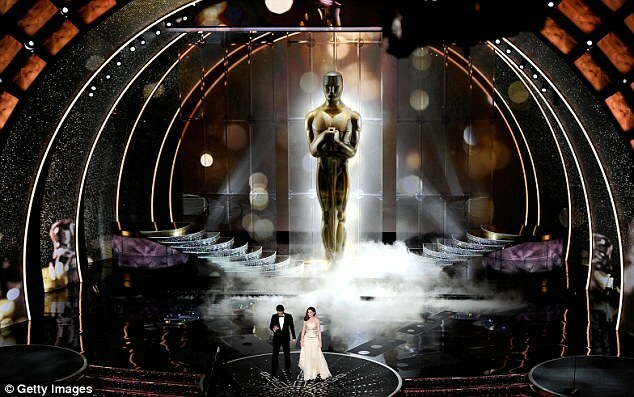 It remains to be seen whether Franco and Hathaway's attempts to make the ceremony more modern and accessible for younger viewers was successful enough to ensure similar hosts next year, or whether producers will go back to a veteran host like Billy Crystal. 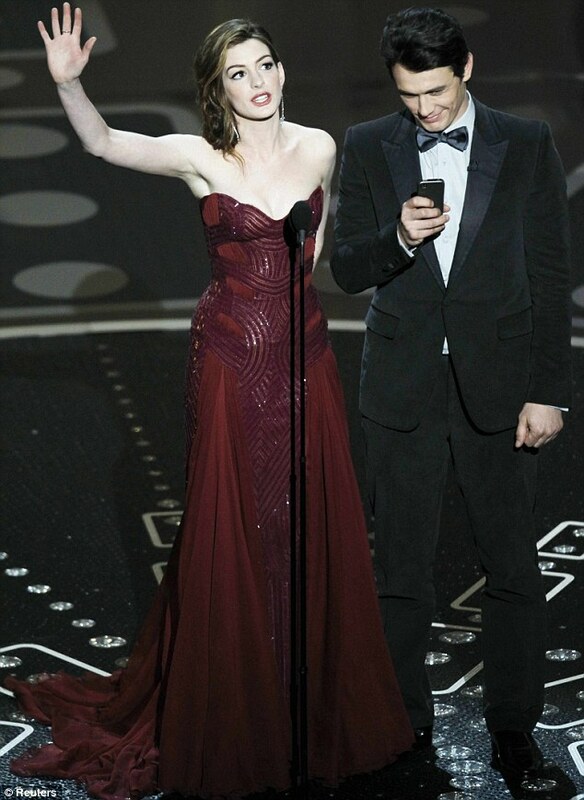 Hathaway had added: 'I love the Oscars. I do. I think it's wonderful. I love being an actor. They've been quietly dating since November but have been maintaining a low profile ever since. But last night, teen sensations Justin Bieber and Selena Gomez finally confirmed their relationship by making their first official red carpet debut at the Vanity Fair Oscar party in Los Angeles. With their arms wrapped around each other, the young pair stared lovingly into each others' eyes as they posed for photographers on the red carpet outside the Sunset Tower Hotel. Wizards of Waverley Place star Gomez accessorised her Grecian-inspired gown with Brian Atwood heels, Judith Leiber bag and Lorraine Schwartz jewels. Gomez has maintained an equally coy attitude about Bieber, saying previously that she considers the Never Say Never star family. Recalling the first time the pair met, Gomez explained: 'When he first started to come over from Canada his manager contacted me and he just said that he would like to meet me and he was just such a good kid. Gomez added she wasn't worried about the attention she was getting for her relationship with Bieber, despite Kim Kardashian receiving death threats from hundreds of fans when she and the singer joked about a mutual crush. Bieber and Gomez looked delighted to be mixing with Hollywood royalty at the Vanity Fair party as they made their way into the exclusive event. Earlier in the evening, Bieber had backed True Grit star Hailee Steinfeld to take home the Best Supporting Actress Oscar. The cute couple weren't the only young celebrities gracing the red carpet at the star-studded event. Country star Taylor Swift caused a stir in a tiny jewelled gold Zuhair Murad dress, while actresses Emma Stone and True Blood star Anna Paquin went for very different looks for the party. Stone opted for an oriental-inspired Chanel Haute Couture dress with purple satin heels, while newlywed Paquin looked stunning in a ruffled red Monique Lhuillier dress and Brian Atwood black shoes. 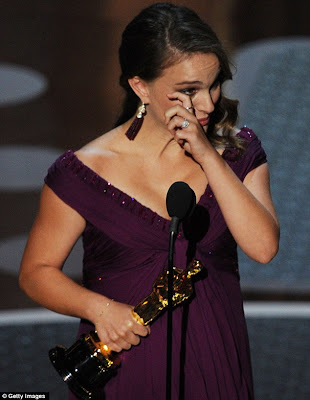 Wiping tears from her eyes, pregnant Natalie Portman dedicated her best actress Oscar for Black Swan to her family, and fiancé, last night. But while her delight was obvious the night belonged to another small budget, independent movie that was a labour of love. The King’s Speech and its star Colin Firth were the toast of Hollywood, winning best film, best actor, best director and best original screenplay. Few in the UK wanted to back the film, but a band of producers and film-makers slashed their usual rates to get it made. With Film 4 and BBC Films both refusing funding, the UK Film Council put up a large part of the money, along with London-based Momentum Pictures and Harvey Weinstein's Weinstein film company. 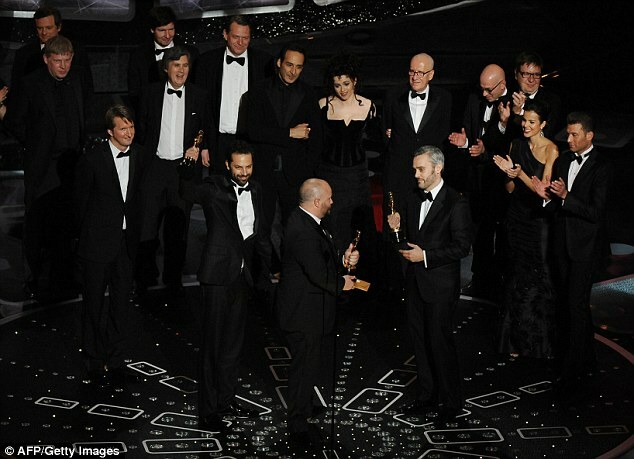 As Academy Awards host James Franco noted ‘The King’s Speech has now become part of Oscar history’. Black Swan star Portman had showed off her bump in her flowing Rodarte gown as she walked to the stage to give her acceptance speech. The pregnant actress wiped away a tear as she also thanked her fiancé, who she met while filming Black Swan, and with whom she is now expecting her first child. Portman said backstage that she was ‘still in a dream-like state’. She joked that the baby she is carrying started kicking during the show when the nominated songs were being sung. Someone asked her if she would be naming her baby Oscar and she replied that most certainly would not be happening. 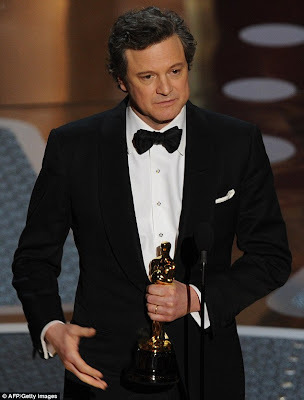 It was a big night for British film as Firth took the best actor award for his role in The King's Speech. 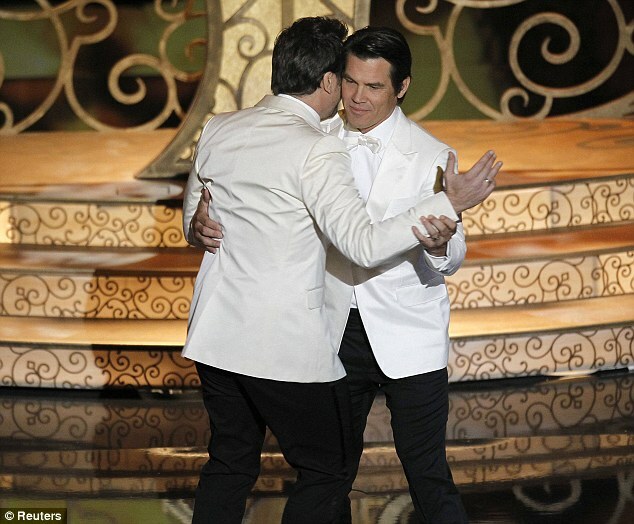 Firth was nominated last year for Tom Ford’s film A Single Man but lost to Jeff Bridges. But now it was Firth’s turn to triumph over his once-again nominated rival. 'I’ve a feeling my career’s just peaked,' he joked. Although it was pretty much a given that Firth was going to collect an Oscar for his powerful portrait of King George VI, and that David Seidler would win for best original screenplay, the wins for best director and best film weren’t as assured as people believed. Halfway through the ceremony when The Social Network won for best editing, one of the King’s Speech team exclaimed, ’well that’s it, we’ve lost it’. That’s because the best editing win is often, but clearly, not always, seen as a signal to which film will win best film. But as the evening wore on Tom Hooper The King’s Speech’s 38-year-old director beat rival David Fincher for best director. He dedicated the prestigious gong to his mother. It was she, he revealed, who first suggested he make the movie, after watching a script read through of the stage version. 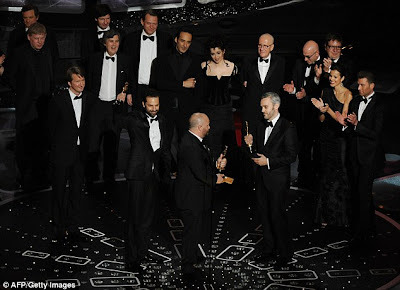 The win surprised many, who had predicted that David Fincher would win for The Social Network. Later Gareth Unwin, one of the three producers with Iain Canning and Emile Sherman, joked that it was his good luck charm, a Union Jack pocket square, that helped them win. 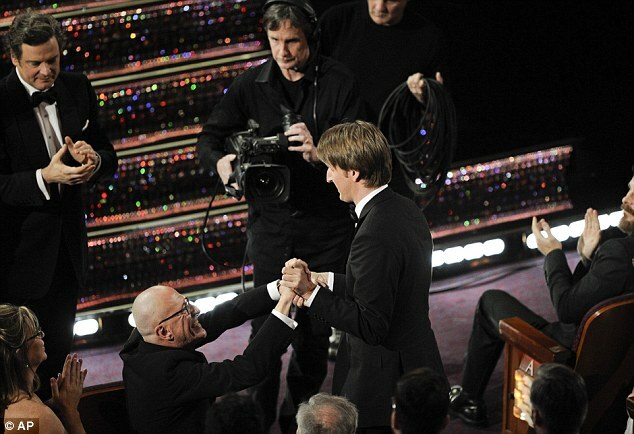 He admitted he ‘borrowed’ the silk square from a table centre piece at the BAFTA awards in London two weeks ago. ‘It felt lucky so I took it’, Unwin joked. The King’s Speech didn’t achieve the sweep that some had hoped, it was up for twelve Oscars, but best picture is a pretty nice trophy to take home. 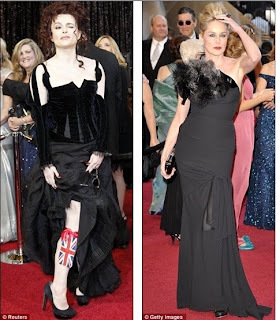 Helena Bonham Carter missed out on the best supporting actress Oscar as Melissa Leo won for her work on The Fighter. 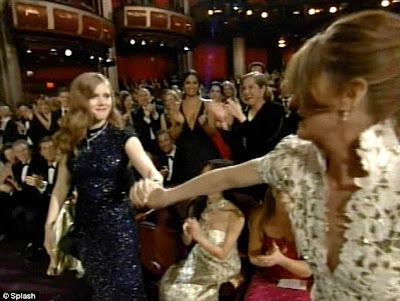 The actress kept her disappointment in check as she applauded Leo, alongside fellow nominee, 14-year-old Hailee Steinfeld. Leo's gong was presented to her by 94-year-old screen legend Kirk Douglas, who happily eked out his moment in the spotlight, having never won himself. 'You pinch me?' Leo asked him, not sure if she was dreaming. Leo, nominated for a second time, had shook as she took to the stage, before accidentally blurting out a swear word, which was removed by editors. Also winning for The Fighter was Christian Bale, named best supporting actor. Bale thanked Dicky Eklund, who he played in the movie, asking the retired fighter to take a bow in the audience. 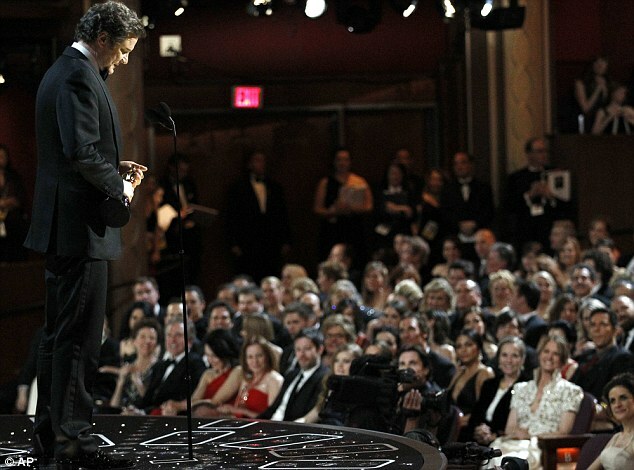 The Social Network took its first Oscar for best adapted screenplay - handed to Aaron Sorkin for his adaptation of the book The Accidental Billionaire by Ben Mezrich. The film also picked up an award for best original score, presented to Trent Reznor and Atticus Ross by Nicole Kidman and Hugh Jackman. Inception's Gary A Rizzo & Ed Novick won an Oscar for best sound mixing and the film also won for best sound editing for the work of Richard King. The film took a third for best cinematography, going to Wally Pfister. 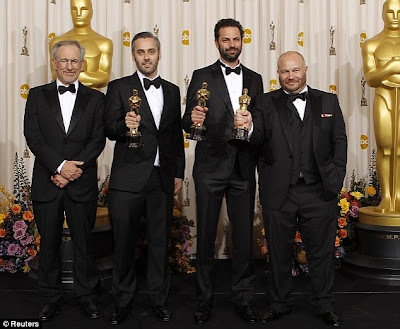 The Oscar for best foreign film went to the movie In a Better World, from Denmark, while the Oscar for makeup went to The Wolfman. 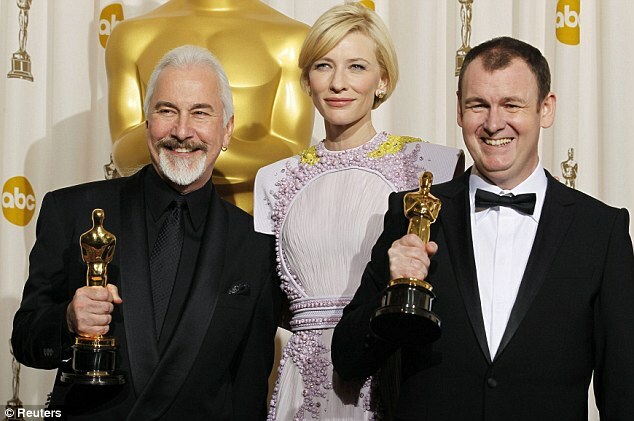 The first award, for art direction, was presented by Tom Hanks to Robert Stromberg (production design) and Karen O'Hara (set decoration) for their work on the 3D movie Alice in Wonderland. 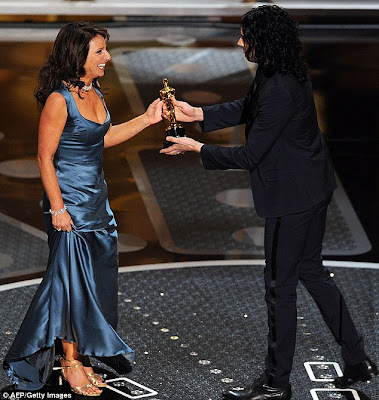 Hanks, a double winner himself, also presented the Oscar for costume design to Colleen Atwood, for her work on the Tim Burton directed movie. The winner for best animated short film was The Lost Thing, while the animated film Oscar was awarded to the considerably bigger budget Toy Story 3. Toy Story also won original song for We Belong Together, Music and Lyric by Randy Newman. Missing out an an award was British graffiti artist Banksy, for his film Exit Through The Gift Shop. Instead the Oscar for best documentary feature went to Inside Job. 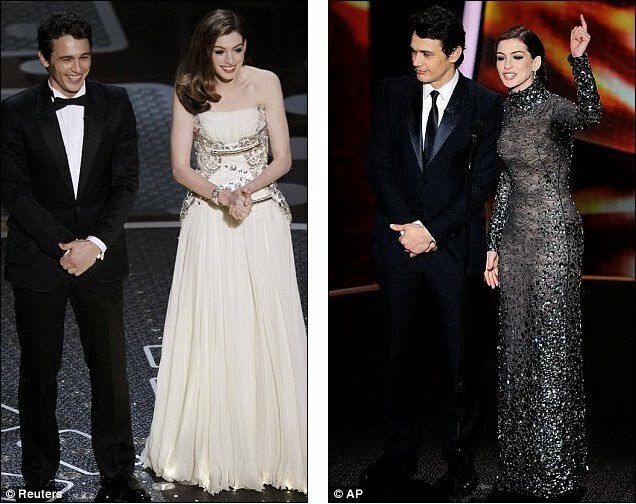 The show opened with co-hosts Anne Hathaway and James Franco inserted into a montage scenes from best-picture nominees, built as a series of dream sequences a la Oscar contender Inception. 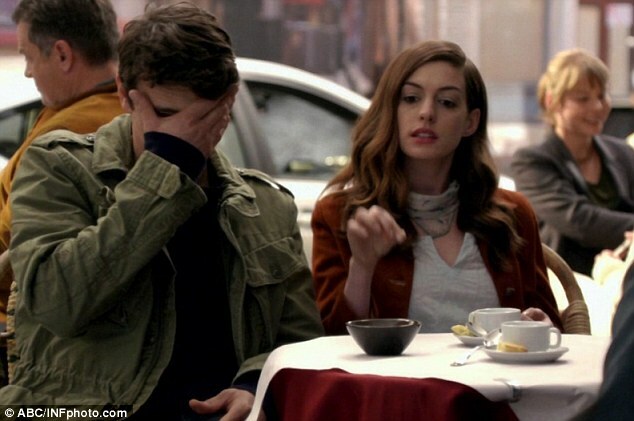 Hathaway and Franco joked about the criticism over their appointment as hosts. 'You look so lovely and so hip,' Anne told James. 'You look very appealing to a younger demographic as well, ' he replied. She was of course referring to Mark Wahlberg, nominated for an Oscar for his role in The Fighter. The actor has made every effort to distance himself from his cheesy past as an 80s pop star. At one stage Franco appeared on stage dressed as Marilyn Monroe. 'I just got a text message from Charlie Sheen,' he remarked, referring to the troubled actor.